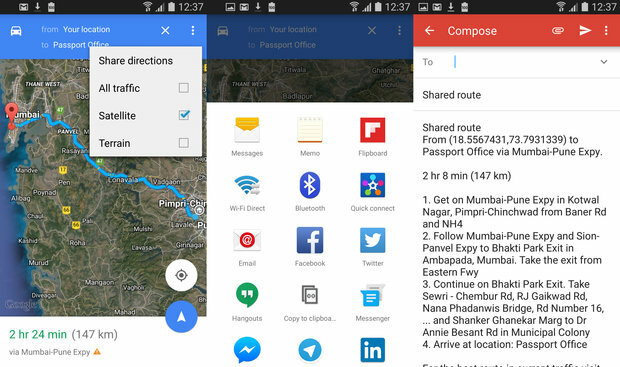 Google Maps for Android – How to share directions? Home Android Google Maps for Android – How to share directions? Google Maps for Android has been updated to version 9.3 and now allows to share directions. With the help of this new feature you can now sends an address and your location with a link that will display your location on Google Maps to anyone via Text message, mail and many other options. The new version of Google Maps offers you the opportunity to share a route text version with your contacts. When you share a route, the next person will receive all the steps that will allow it to reach the position you have shared. Open Google Maps and Create a route by selecting the Starting point and end point. Then select the means of transport. Among the choices are available, select the route you choose. Before starting the route, press the three dot Menu button at the top right. Then it will open a list of different option like Messages, Email, WhatsApp etc. via you can share the directions. Tap on any option via which you want to share directions. That’s it, you’ll be able to share the step-by-step instructions and directions to any of the selected share options on Android. Obviously, the shared route will be created from a point of departure and arrival you have selected. If you can’t see the Share directions on Google maps for android then you can download the updates now via the Play Store.